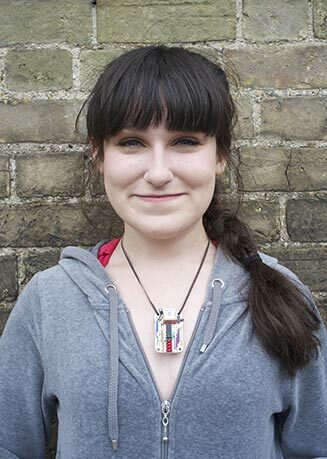 This article describes an Odometer/Speedometer Pendant I built for a friend who is keen on walking, and wanted to see how far she'd walked each day. It's small enough to be hung round the neck on a lanyard, and displays the distance travelled in miles (up to 400 miles). It can also be switched to show the speed in mph, or the time in hours and minutes. The Odometer/Speedometer Pendant, based on an ATtiny84. I restricted the leftmost display position to displaying 1, 2, or 3, none of which use segment f. We can therefore use the same pin to drive the f segments and digit 0. We don't need to display the rightmost decimal point, so we can use the same pin to drive the dp segments and to drive digit 4. Because PA6 is dedicated to the USI serial input we have to mask this bit out when writing to port A. The ATtiny84 doesn't provide a USART, so I implemented a simple 9600 baud receive-only UART using the ATtiny84's USI, as described in an earlier article: Simple ATtiny USI UART 2. I then measured this frequency with a frequency meter, and recompiled the program with different OSCCAL values until the meter read 62.5kHz. When a byte has been received by the USI a USI overflow interrupt is generated, and the interrupt service routine simply calls ParseGPS() to process the received character. This is described in my earlier article Minimal GPS Parser [Updated]. If the bottom bit of MCUSR is set it was a power-on reset, and we clear the Distance and Mode; otherwise we step to the next of the three modes. Finally the setup() routine initialises the USI and display multiplexing, and displays a flashing dash on the display until the GPS module gets a fix. The GPS module can give small speed values even when you are stationary; to avoid these accumulating to give an apparent distance reading the program ignores speed values less than 100 (1 knot). If Mode is 0 the display shows the distance in miles with two decimal places. To calculate this the speed in knots, accumulated every second, is multiplied by 1.151 and divided by 3600; 19/59438 gives a good rational approximation to this. If Mode is 1 the display shows the speed in miles per hour. To calculate this the speed in knots is multiplied by 1.151; 38/33 gives a good approximation to this. If Mode is 2 the display shows the time, in hours and minutes. Note that this is GMT; you will need to do some extra programming if you want to account for Daylight Saving Time/Summertime. You could also add an extra mode to display the average speed, since the start of the journey. I then aligned the wires with holes on the prototyping board. Finally I attached the GPS module to the board using a double-sided sticky pad, and soldered the wires to the pads on the board. I powered the circuit from a compact 3.7V LIPO battery, attached to the back of the board with a double-sided sticky pad. Note: The GPS module is rated at a maximum supply voltage of 4.3V, so you should disconnect it from the circuit while programming the ATtiny84 using the Tiny AVR Programmer, which supplies 5V to the circuit. 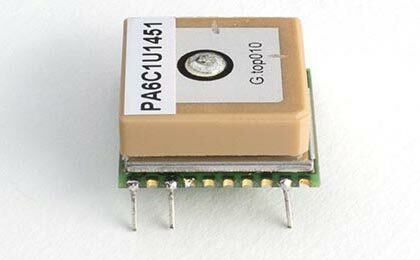 Alternatively, power the GPS module via a 3.3V regulator. I compiled the program using Spence Konde's ATTiny Core, which supersedes the various earlier ATtiny cores . Select the ATtiny x4 series option under the ATtiny Universal heading on the Boards menu. Then choose B.O.D. Disabled, Pin Mapping: Counterclockwise (like ATTiny Core), ATtiny84, 8 MHz (internal) from the subsequent menus. Choose Burn Bootloader to set the fuses appropriately. Then upload the program using ISP (in-system programming); I used Sparkfun's Tiny AVR Programmer Board; see ATtiny-Based Beginner's Kit. Here's the whole Odometer/Speedometer Pendant program: Odometer/Speedometer Pendant Program. 11th March 2017: I've updated the program to use the latest version of ParseGPS(), and made a few minor changes to ensure that it compiles correctly using Spence Konde's ATTiny Core. ^ Bubble Display - 7-Segment (4-digit) on Sparkfun. ^ Bubble Display - 7-Segment (4-digit) on Proto-PIC. 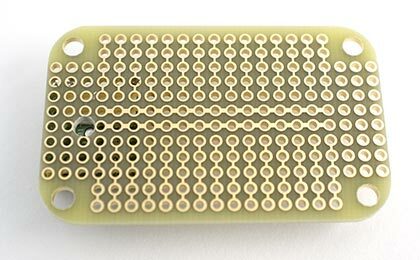 ^ Adafruit Perma-Proto Small Mint Tin Size Breadboard PCB on Adafruit. 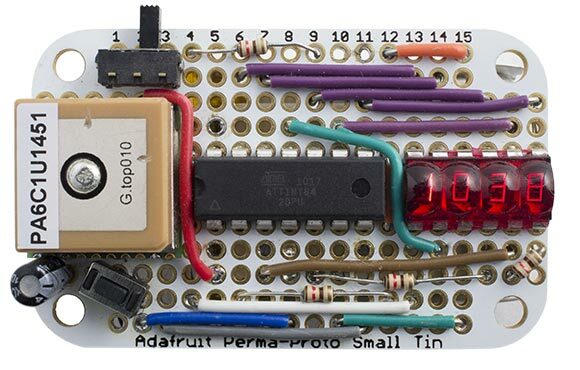 ^ Adafruit Perma-Proto Small Mint Tin Size Breadboard PCB on Proto-PIC. ^ GTPA010 Datasheet on Adafruit.